Agriculture Archives - Africa M.E. 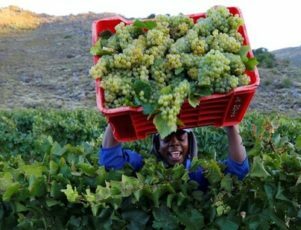 JOHANNESBURG (Reuters) – South Africa, the world’s seventh biggest wine producer, is expected to see the smallest harvest in more than a decade in 2018 after drought and lower plantings hit yields, industry experts said. The winelands are mostly in the coastal Western Cape province which was declared a disaster area in May due to a severe drought that has dried up dams and led to water restrictions for residents and industry. The 2018 harvest is expected to be much smaller than the estimated 1,434,328 tonnes produced in the 2017 crop, based on a survey conducted in the last week of November by industry body South African Wine Industry Information and Systems (Sawis). Sawis, which will give its final crop estimate in August, did not give a figure for 2018 but said it would likely be less than in 2017. “If in certain areas we don’t get rain it could end up smaller,” Sawis Chief Executive Officer Yvette van der Merwe told Reuters. VinPro, an industry body, expects the 2018 crop to be the smallest since 2005, when 1,157,631 tonnes were harvested due to drought and diseases in some production areas. “This means that wine grape producers’ water resources were cut by 40 percent to 60 percent and they could not fully meet their vines’ water demand,” Vinpro consultation service manager for the wine industry, Francois Viljoen, said in a statement. South Africa which produces 3.9 percent of the world’s wine, harvests its winelands between February and March. Western Cape dams were only 34.6 percent full last week compared with 50.4 percent in the same period last year, according to local government statistics that show a steady annual falls from 2014 when they were 90 percent full. White and black frost damage in the Breedekloof, Robertson and Worcester regions could also hurt the 2018 harvest. Paul MakubeSenior, agricultural economist for FNB Business, estimated harvests would be 10,000 to 15,000 tonnes lower in those areas. South Africa’s wine industry, which exports 440 million litres of wine a year and sells 400 million litres locally, could see higher prices if the crop is significantly decreased. “If you have a lower crop the prices are going to be higher and it will eventually be passed on to the consumers,” said Makube, saying any price rise would depend on the harvest size. Global wine production in 2017 is also set to fall to 246.7 million hectolitres – its lowest since 1961 – further supporting prices, after harsh weather in western Europe damaged vineyards, the Paris-based International Organisation of Vine and Wine (OIV) said in its estimates in October. CAPE TOWN/WINDHOEK (Reuters) – The African Development Bank (AfDB) has approved a total of 2 billion rand 148 million) in loans to boost Namibia’s education and agriculture sectors, it said on Tuesday. The funds are aimed at helping reduce youth unemployment by boosting technical and vocational training, and reducing food imports by the South-western African country. Both the education and agriculture projects will receive additional Namibian government contribution, the AfDB said. 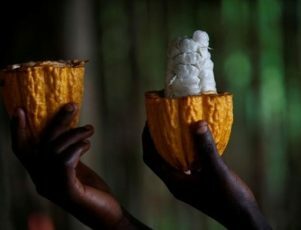 Cameroon’s distinctive Penja pepper, hailing from the volcanic soil of the Penja valley, is the first African product to receive an internationally protected geographical indications label (PGI) by the African Intellectual Property Organization. Recognized by the European Union, the label awards the name of an area, a specific place, or in exceptional cases, the name of a country, as a description of an agricultural product or foodstuff. The product must be traditionally and at least partially manufactured within the region and thus acquire unique properties. The Penja pepper, known for its bright, musky flavor, has become a prized spice used by Michelin-starred chefs around the world and fetches as much as USD$33 per 3.5 ounces. There is some confusion as to the origins of the pepper, some saying a farmer stumbled across it and gave it to his wife to plant, whilst others maintaining a French colonialist planted it on his banana plantation, but it is clear the white peppercorn rose to prominence through French entrepreneur Erwann de Kerros. Kerros came across a farm growing the pepper, in Cameroon, in 1992 and was astounded by its distinct flavor. He stayed in the region for four years before returning home to reveal the great qualities of the pepper. Today Kerros runs his spice company, Terre Exotique, with almost $10 million in revenue. The PGI label on Penja pepper has also helped the local community who farm it. The small town of Penja, and surrounding villages have been transformed by the localized Penja production. 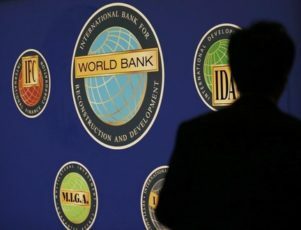 According to law professor Michael Blakeney, from the University of Western Australia, who has advised nations on intellectual property rights, there are huge economic benefits from the PGI label. You can charge between 8 – 10% more for a product that’s sold under the label and it protects rural economies: farmers stay where they are if their product is profitable, he said. The label prohibits the products name from being used by producers outside of the region, just as champagne must be produced in the Champagne region of France and therefore means more work for the local people of Penja. Since the label was awarded in 2013, some 200 new farmers have taken up production, said pepper plantation owner Rene Claude Metomo. Many others have abandoned growing coffee and cocoa in favor of Penja pepper. Although there are some growers in Madagascar, Cameroon is the only country where it’s grown on a large enough scale to be reflected in export statistics. 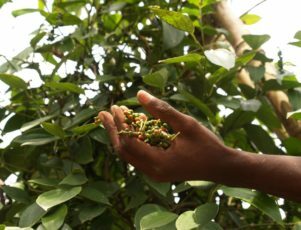 Over the past five years, production of Penja pepper has increased more than fifteen-fold, according to Business Cameroon. In 2012, before the PGI label was awarded, production levels of Penja were at 18 tons per year, but in 2015 that figure had risen to 300 tons and continues rise. With around 60% of production consumed locally, the remainder is exported to the European market and chefs around the world are clamoring for more. New York City chef, Lior Lev Sercarz said he buys around 331 pounds of Penja pepper per year. It’s got herbaceous, grassy notes and doesn’t burn, he said. Business Cameroon also reports that there are plans made by Swiss agro-food giant, Nestle, to use Penja pepper in their Maggi bouillon cubes. Maggi stock cubes, officially represents 90% of the production of the Nestle Cameroon factory, which supplies the whole CEMAC market – Cameroon, Congo, Chad, Central African Republic and Equatorial Guinea. The project would mean an increase in demand and production of Penja pepper, and a further boon to the local people of the area. Most of whom are farmers who would not be protected if it weren’t for the PGI label. Penja pepper is one of three African products to be awarded the PGI label, along with Oku honey from Cameroon and Ziama Macenta coffee from Guinea. According to the general manager of the African Intellectual Property Organization Paulin Edou Edou, there may be six more African products with the PGI label in the near future. Only a few years ago the notion of intellectual property was unknown in the African continent, said Edou Edou. Now, countries are lining up to have products registered. With the success, Cameroon has seen with Penja pepper, it is easy to see why. Kenya’s mango exports have jumped by 400 percent in the past five years, thanks in large part to a switch from chemical to bio pesticides to control fruit flies. In the past, the troublesome insects forced mango farmers to leave a significant share of their crop on the ground or to use chemical pesticides that meant the fruit was not acceptable in many foreign import markets. But the introduction of new methods of controlling pests using naturally occurring substances is giving mango farmers a boost. Louis Matheka, sales manager for the exporter Mangos from Kenya, said mango production increased by 27 percent during the season that ended in April compared to a year earlier. At the same time, exports were up 30 percent. In the latest season, Kenya exported 26,000 metric tons of mangos, mostly to the Middle East. 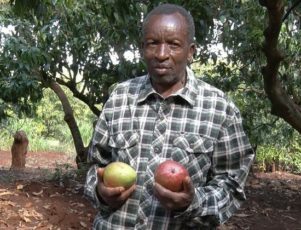 Most of Kenya’s growers are small farmers who have struggled to make their mango crops pay because fruit fly infestations often resulted in more than half the fruit being wasted. Erratic yields in turn made it difficult to enter and meet the requirements of formal contracts with exporters. Meanwhile, fears of spreading fruit flies to importing countries along with high use of chemical pesticides meant the harvests were off-limits to many foreign import markets. Instead, farmers sold their fruit for lower prices at local markets. But in recent years, companies have developed promising bio pesticide alternatives to help an estimated 60,000 Kenyan growers control fruit flies. One Kenyan company, Real IPM, has pioneered fruit fly control that uses a common insect-killing fungus, Metarhizium (Met) 69, that occurs naturally in the soil. Real IPM developed the system with funding from USAID and the Rockefeller Foundation. Real IPM equips farmers with the powdered substance, which is used in traps. Flies that enter the traps are contaminated and exit the trap. They are able to contaminate other flies by grooming or mating before they die. The system requires at least 20 traps per hectare. The fungus, which does not leave a residue because it is naturally occurring, can also be sprayed onto trees to infect larger adults or onto the soil to kill pupae. One farmer, Henry Ngari, told Reuters he is now able to sell 90 to 95 percent of his crop. “That’s a big improvement for farmers. We were losing around half of the crop because it was infected by fruit fly,” Ngari said. The system is initially more costly than chemical pesticides. But the traps only have to bought once, compared to many applications of pesticides. The system also greatly reduces manpower necessary to control fruit flies. Ngari said he used to employ six men per day to spray chemicals. “Now it’s just one person to put a trap in place. That could be me or my wife,” Ngari said. According to Sunday Ekesi, head of plant health at Kenya’s International Centre of Insect Physiology and Ecology (ICIPE), the use of bio pesticides is on the rise in Kenya. Companies including Dudutech, Kenya Biologics and Farmtrack Consulting also offer environmentally friendly tools to fight pests and plant diseases. Experts believe bio pesticides will help Kenya’s growers further boost production and expand their export markets from the Middle East to Europe. The United Arab Emirates imports more than 55 percent of the African nation’s mangos followed by Saudi Arabia, Bahrain and Qatar. Jonathan Bamber, whose Burton and Bamber buys from around 100 small farmers and produces dried mangos, said Kenya could become one of the world’s top producers. “It could be a huge revenue stream for small-scale farmers, if we can develop the market and demand, as well as the quality on the supply side,” Bamber said. Stability is not a word often used to describe the status of small-scale farmers, particularly not those in Sub-Saharan Africa. African farmers are especially vulnerable to variable climates: should a rainy season arrive early or late, be heavier or lighter than anticipated, an entire community’s livelihood can turn to dust or be washed away in a flood. At the recent African Honey Exhibition, experts discussed the viability of beekeeping and honey production as not only a key to eradicating poverty for farmers, but as an industry that has a multitude of positive externalities, such as pollination. African climate: in a 1990 paper for the Food and Agriculture Organization, Stephen Adjare wrote that beekeeping and honey production had long been occurring in Eastern Africa, but that they made use of antiquated techniques that inhibited expansion or growth. His points as to why Africa is ideal for beekeeping and honey production are now being echoed by development experts and economic advisors around the world. Tropical apiculture is not only inexpensive, but it allows farmers to be self-reliant. 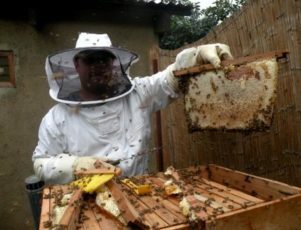 It is not dependent upon the importation of expensive foreign equipment or experts, it does not require a beekeeper to own large amounts of land, as hives can be created on very small plots or even in a garage or shed, bees positively impact the surrounding environment through pollination and the semi-arid climates that render other crops fallow are ideal for beekeeping. According to one source, African bees are better for pollinating that European or American bees. That is because African bees emphasize colony growth over honey production, which necessitates more pollen to feed to bee larvae. In this way beekeeping may even be an excellent complementary practice for farmers with crops that require pollination, such as fruit trees. Kenya is an interesting example of the potential for honey production. While it is not the continent’s largest producer, it is the largest consumer. Demand exceeds the country’s production, and so tons of honey are imported from neighboring Tanzania each year. The production gap is so large, in fact, that international exportation is yet to be a viable option, despite the high demand of the United Arab Emirates for African honey. This is due in part to the small-scale nature of Kenyan apiculture. There are currently no commercial beekeeping or honey production operations in East Africa. Small-scale farmers currently manage the sector, which has both positive and negative aspects. The most obvious positive aspect of this is that more individual farmers profit– there is no large company taking a portion of their profits. The downside is that the industry is not operating at maximum efficiency given the gap in production ability. It seems unlikely; however, that consolidating wealth produced in this industry into the hands of a corporation would prove at all beneficial for the average African farmer who turns to beekeeping as a mode of poverty prevention. In a 2012 video with more than 35,000 views, modern techniques for African beekeepers are explored through the development of modern hives by a local company. This video demonstrates the sustainability of hive production: not a single aspect of beekeeping is wasted, meaning fewer dollars lost in the production of new colonies. Should apiculturists be enabled to engage in modern beekeeping techniques, this could greatly benefit their honey production and greater pollination? Unfortunately, it does not seem that African bees are immune to illness. Bees around the world have been plagued by a parasite that cut global production in half. Unlike the agriculture branches of European or American governments, there has yet to be a concerted response to this threat by African governments. Responding to such threats require expensive scientific experiments and investment. Investing in modern beekeeping techniques for small-scale African farmers has enormous potential. Doing so provides economic security for individuals and their families, and has positive externalities for surrounding crops, such as fruit trees or flowers, both of which are large export industries on the continent. Investment requires careful planning; including contingency plans for occurrences such as colony die off due to parasites or extreme weather. That being said, honey may just turn out to be the golden ticket out of poverty for African farmers. Jamila Abass is a shining example of the young, innovative, tech-focused generation emerging throughout Africa. Her business, M-Farm – a tech solution that provides valuable services to Kenya’s farmers – is a fantastic model of how technology is breaking down long-standing barriers. Early in her life, Abass worked tending crops in her family’s small kitchen garden. She grew and sold kale and coriander, giving her perspective on the agricultural industry, and playing a key part in her later interest in rural development. Abass proved to be a gifted student. She went on to study Computer Software Engineering at the Université Abdelmalek Essaâdi Tétouan in Morocco. After graduating in 2009, Abass teamed up with fellow tech entrepreneur Susan Oguya. They were both perturbed by the state of Kenya’s farming industry. Abass said, “The newspapers always had sad stories of farmers getting exploited by middlemen.” She explained that unscrupulous intermediaries were leveraging farmers into selling their produce for a fraction of their true market value; a situation which had been ongoing for decades. Abass and Oguya wanted to develop a solution to tackle this issue. They conceptualized a digital platform that farmers could access through their mobile phones. They theorized that this marketplace would arm farmers with the information they needed to protect themselves and make smarter decisions. Looking back, Abass explained “They (farmers) had no information and no alternative market. We wanted to close that information gap between the farmers and the market”. Soon after coming up with the idea, the pair took their concept to the IPO48 challenge, a kick-starter designed to support promising online solutions. Abass and Oguya won a US$10,000 dollar prize and subsequently began building M-Farm. M-Farm began as an SMS service by which farmers could check the daily prices for over 40 popular crops, and identify buyers throughout the country. Through partnering with renowned tech startup M-Pesa, M-farm allowed farmers to make and receive mobile payments. With mobile phone technology widely available across Kenya, M-Farm is an affordable option for even the poorest rural farmers. By 2012, Abass had over 5,400 users on the platform. These farmers had managed to more than double their profits, thanks to the direct links M-Farm offered with legitimate buyers and exporters. In late 2012, M-Farm made the finals of the highly prestigious Unreasonable Institute Exhibition. M- Farm’s success was on full display, and Abass’s excellent presentation brought valuable exposure to the firm, ultimately attracting further investment. With financing secured, Abass and the team looked at ways that they could improve their service. They identified that for some farmers, simply providing them with pricing information was not enough to improve their fortunes. Many were still struggling to access the markets and get a fair price for their crops. Abass identified that rural growers were producing in low volume, and that for major buyers, it was impractical and expensive to acquire the produce they needed from multiple small-scale enterprises. To counter this, M-Farm launched its group selling tool this enabled local farmers to form cooperatives, making their produce more attractive and easier to sell. Abass quickly extended the cooperative model by rolling out a buyer&#39;s cooperative feature, whereby farmers can band together and negotiate better purchases of fertilizer, seeds, and equipment. The M-Farm platform has evolved to become a powerful and promising tool. As Abass said, “There are so many things you can do with the technology.” Today the platform offers transport services to farmers through partnerships with local logistics and haulage businesses. M-Farm now also arms its members with valuable industry knowledge. For instance, farmers can access expert agricultural advice, forecasts for future crop demands, or guidance on international regulations such as prohibited chemicals and pesticides. Abass has also made inroads into the international market, establishing links with major retailers in Europe who are keen to run a socially responsible supply chain. With over 22,000 clients now thriving in Kenya, it’s clear Abass has a seriously effective business. She now intends to scale M-Farm globally, bringing its considerable benefits to farmers in other emerging countries. The story of Abass and M-Farm signifies how entrepreneurship and technology are changing the face of Africa. Despite an unstable economic context , the embattled government of Zimbabwe is putting on display ambitious growth targets for the next two years. The government recently projected an annual growth rate of 6.5 percent between 2016 and 2018. That forecast contrasts with small economic growth rates in recent years jeopardising President Robert Mugabe’s legitimacy. Mugabe, the world’s oldest state representative aged 92, has been in office for 36 years now. Finance minister Patrick Chinamasa had originally forecast an economic expansion of 2.7 percent in 2016. But Chinamasa was forced to cut the target by nearly half, to 1.4 percent, in the face of the negative impact of the drought and falling commodity prices worldwide. Zimbabwe’s economic challenges include cash shortages, its worst drought in decades, heavy reliance on imports, crippled agricultural and manufacturing sectors, a drop in tourism, and worker strikes that have paralyzed key sectors. “What you have are highly incendiary conditions in Zimbabwe,” said Charles Laurie of the political risk firm Verisk Maplecroft. The nation is “ripe for a power grab.” Mugabe has cracked down on opponents and the government in August increased its surveillance of social media and cellphone channels while the military went on high alert in the face of what it said were potential cyber-terrorist attempts to destabilize the government. But the government cash shortage is evident prompting a government decision to start issuing bond notes that some see as a shadow currency. For the past two months‚ the government has been late in paying the military‚ police and other public workers. Zimbabwean banks have restricted the amount of cash that can be withdrawn, sometimes allowing only $20 per day. Some experts say the country may be headed into its worst financial crisis since 2008-2009, when Zimbabwe dropped its national currency in the face of hyperinflation that reached 500 billion percent. The United States dollar, South African Rand and recently the Chinese Yuan, have been introducedd by the government as acceptable currencies in Zimbabwe. However, the government plans to introduce bond notes has sparked fears that large government issues of the notes will effectivelynamount to printing more money – a move that could drive inflation. Zimbabwe was on the road to recovery in 2010-12 after a disastrous land reform initiative, and annual economic growth topped 10 percent in 2012. However, since then, growth has trended downward – 4.5 percent in 2013, 3.1 percent in 2015 and only 1.5 percent in 2015. The government said agriculture, fishing, manufacturing, and construction, would help drive growth in the next two years. At the same time, the government forecast targeted annual inflation of less than 1 percent and a budget deficit of 1.2 percent of gross domestic product in 2017 and 2018. But a number of key Zimbabwean economic sectors are highly challenged. Agriculture, the backbone of Zimbabwe’s economy, lacks funding and farmers are straddled with strict loan requirements driven by banks’ concerns about security for 99-year leases of many farms. The government is counting on receiving $5 billion from China to revive the agricultural sector. The nation hopes that China will provide funds for farmers to grow tobacco, flowers, cotton, and soya beans and to breed beef cattle. In the aftermath of dramatic drought the government was forced to import more than 700,000 tons of maize adding to the country’s trade imbalance, which hit $3.3 billion in 2015. The manufacturing sector is currently hampered by obsolete equipment and power shortages as well as intensifying competition from cheaper imports. Currently, the sector has reduced production and is operating at about one-third of its capacity. A requirement that foreign investors sell controlling equity stakes in their companies to local residents has further dampened enthusiasm for investment. Direct foreign investment dropped by nearly a quarter in 2015 to $421 million. The decline was attributed to assessments showing high levels of corruption as well as bureaucratic red tape. Tourism has also declined because of a ban on ivory imports and a 15 percent tax on accommodations and tourist services. A report by the Zimbabwe Council for Tourism report said the nation lost more than $100 million in tourism revenue last year because of the tax. Experts dispute the nation’s ability to meet the new economic growth targets. John Robertson, an independent Zimbabwean economist, said it was unlikely that funding from abroad would revive the economy. Oswell Binha, an economist and chairman of Buy Zimbabwe chairman said the economy, which is at risk of recession, simply does not have the capacity to grow at a rate of more than 6 percent. “Zimbabwe under its current circumstances will never achieve any growth beyond 4 percent,” Binha said, as a result of the country’s inability to maximize key drivers of its economy. Officials are touting the launch of an electronic seed exchange in West Africa as an important step in improving productivity and food security. The online platform will serve seven West African countries – Benin, Burkina Faso, Niger, Ghana, Mali, Senegal and Nigeria. The platform is based in Abuja, the capital of Nigeria, the leading producer of seeds in the region. Officials hope the new platform will contribute to agricultural productivity. They want to double high-yield seeds from 12 percent in 2012 to 25 percent by 2017. The electronic platform aims to provide an online point of connection for seed producers, traders, distributors, farmers, researchers and other industry stakeholders. In the long run, the platform could help improve the practice of seed quality analysis and the official catalog of seed varieties. The platform will help promote the seed trade in the region while fostering healthy competition in the marketplace, said Philip Olusegun Ojo, director general of the Nigerian Agricultural Seeds Council. Ojo noted that about 70 percent of the seeds used by farmers in West Africa are produced in Nigeria. Regulatory changes have boosted the country’s seed industry, Ojo said, and today more than 155 seed companies operate in Nigeria. The electronic platform will provide farmers with information on the origin of seeds and their country of availability. The West and Central African Council for Agricultural Research and Development has developed the program in cooperation with the West African Agricultural Productivity Program. Abdou Tenkouano, executive director of the council, said Nigeria has the capacity to supply nearly two-thirds of the farmers in West Africa need. Tenkouano said that the platform was designed to become a hub that will be a precursor to regional research and development initiatives in agriculture. Heineken Lokpobiri, minister of Agriculture and Rural Development, said seeds are key to food security in Nigeria, which spends more than $6 billion annually on food imports. 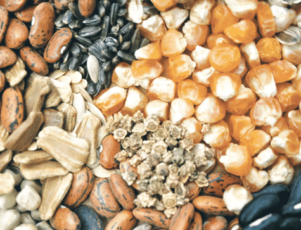 “The objective of achieving food security can only be realized through the availability of quality seeds,” Lokpobiri said, noting that more companies should be encouraged to enter the seed market as the nation attempts to diversify its agriculture. 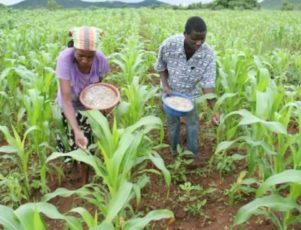 According to Lokpobiri, the quality of Nigerian seed has improved while production has increased from about 5,000 metric tons in 2007 to 173,000 metric tons in 2015, mostly maize and rice seed. Revenue increased to more than $70 million. “We were able to achieve this success through enhanced collaboration with research institutes, liberalization of foundation seed production, strengthening of the national seed certification, as well as total withdrawal of government agencies from certified seed production and marketing,” he said. 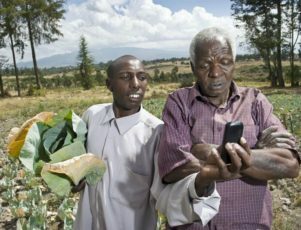 A Swedish company has developed an innovative application that is delivering accurate GPS-based weather forecasts to farmers in six African countries. Since the beginning of 2016, more than 80,000 farmers in Ivory Coast, Ghana, Mali, Niger, Nigeria and Senegal have put Iska Weather to use. The app has generated more than six million weather forecasts. The forecasts, which the developer said are more than twice as accurate as those provided by other models, help farmers determine the optimum times to sow, fertilize and harvest their crops. Obtaining accurate weather forecasts have become more and more critical for African farmers as many parts of the continent grapple with drought and severe weather attributed to climate change. Ignitia, the Swedish company that developed the mobile weather forecasting service, wants to expand the service to other West African countries using a grant of $2.5 million from the governments of the United States, Sweden, South Africa and the Netherlands. The goal is to connect 1.2 million small farmers with the service by the end of 2017. Eventually, the company plans to offer the service in 20 countries in Africa, Central America and Southeast Asia. Lizzie Merrill, Ignitia project manager, said the company’s forecasting model is more than twice as accurate as others, which typically are inaccurate more than 60 percent of the time. For farmers in the dry climates of sub-Saharan Africa, even a slight change in weather can results in significant losses, she said. “Traditional global weather models have only been able to predict weather in the tropics with 39 per cent accuracy – not good enough,” she said. Ignitia says its model has a weather prediction accuracy rate of 84 per cent since it launched as a pilot in Ghana in 2014. Peter Okoth, an agronomist and soil scientist at Newscape Agro Systems Ltd. in Kenya, said governments in tropical nations have failed to invest in programs to provide accurate weather forecasts. Okoth said Iska Weather could be used in other dry parts of Africa and that governments would benefit from because farmers could produce and earn more. Support for better forecasting tools could “bring a big change on how farming is conducted and managed on the African continent,” Okoth said. Yields of small-scale farmers in sub-Saharan Africa are among the lowest in the world, resulting in food insecurity, poverty and low economic growth. Estimates of crop losses in the region because of weather range from 20 to 80 percent. 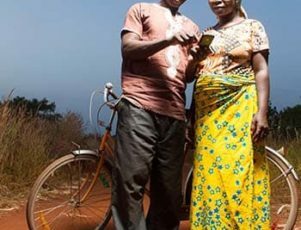 Ignitia’s tool provides two-day, monthly and seasonal forecasts to farmers via SMS in a text-light format, which can be received on the most basic mobile phone. The forecasts are tailored to each farmer’s specific location by an automated tool that pulls in the closest GPS coordinate for each subscriber. The farmers are charged four cents per day for the service. They can pay in micro-installments using pre-paid credits and it is easy to opt out. The service is delivered in partnership with telecommunications companies in each country. The forecasting service typically accounts for less than two percent of their total expenses, according to Ignitia. The expense is more than offset by increased income, the company said. Liisa Petrykowska, Ignitia’s chief executive officer, said Iska Weather provides small farmers with “vital information they need to mitigate risk and create resilience,” enabling them to “increase yields and improve their livelihoods year after year”.